People sit at a hodgepodge of tables next to the store front soaking in the day’s news and sipping on an iced dirty chai. It is a warm summer evening and other patrons walk out of the shop smiling and giving you a familiar nod of hello. Walking inside the chandelier twinkles in the setting sun beaming in from the picture window. A crowd is swarmed over a computer screen looking at a customer’s wedding album and parts ways to let strangers take a peek. The people here are as welcoming as the smell of brewing coffee. This is The Wise Bean. The Wise Bean, warmly known as “The Bean”, opened in 2004. 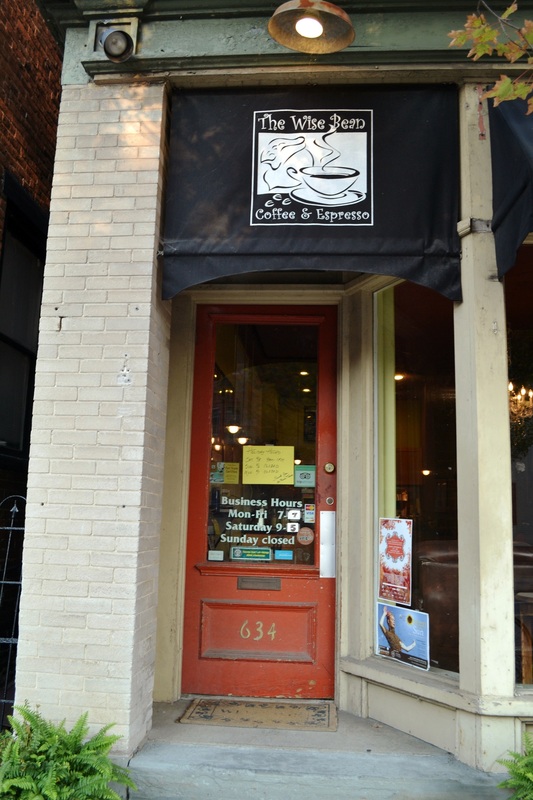 It is a family owned and operated coffee and espresso bar run by the Youngs: Bill, Joan, Sam, and Kelly. The family was inspired to open the shop after visiting Boston and noticing a coffee shop on nearly every block. It was Bill who found The Bean’s home in Bethlehem. Located within a few blocks of Bethlehem’s Main Street, The Bean is on North New Street. The Youngs did thorough research prior to picking this location – Bill actually sat at the corner of North New and Broad Street studying the traffic patterns before settling on an old office (believed to be previously sell hearing aids). After gutting the place, it was glitzed and glamoured to what The Bean is today. For some more history of The Bean check out their website. If you visit The Wise Bean’s site, you will also spot some key terms: Community Affair and That Third Place. Both of which are endearing and relay the environment of this coffee bar. Both key terms revolve around the PEOPLE who make The Bean what is it. Aside from the people, when asked what sets The Bean apart from other coffee shops in Bethlehem the answer was their PRODUCT. First, their beans are fresh. So much so that they do not brew dark roasts as all of their coffee is already very flavorful due to the freshness of their beans. They know their coffee. In fact, since opening in 2004, they have been serving cold brew – far prior to its recent popularity. They even have an espresso cold brew which is delicious! One of their most popular drinks is the crème brûlée latte. This is a latte with white chocolate and caramel. In the summer you can get it iced, and in the winter hot. Another unique feature of the The Bean are their gift certificates! They do not use paper or plastic gift cards and instead use sustainable ceramic coins. Each coin is worth five dollars. When purchased it comes in an adorable bag with ribbon drawstring and loose coffee beans. When the coin is remitted, it gets recycled to be used again within the store. It is the whole package: cute, practical, and good for the environment! Never refrigerate or freeze your coffee beans! Beans are supposed to be oily and not dried out. When stored in moist cold places like the refrigerator the beans absorb moisture and smells of leftovers or frozen meats/seafood. The best way to store coffee is in a dry, dark, and cool place. When asked what would be the best bean to use for home cold brews in a French press, Sam suggested Mexico Oaxaca. 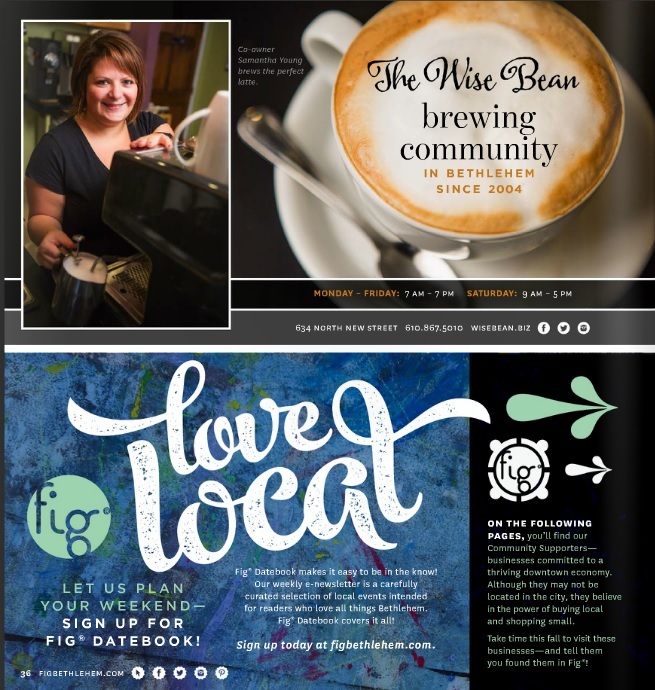 Check out the newest fall issue of Fig magazine which features The Wise Bean’s first print advertisement! So next time you are in pursuit of a cup of coffee made with the freshest beans, a friendly smile, and want to support local business – head to The Wise Bean! Great piece! Makes me wanna head over there right now, but I’ll have to wait for a morning on the weekend. It is a great place – the beans are incredibly fresh and flavorful! Be sure to check back with me if you go! Thanks Vanessa! This looks like a great place to take my nutrition group! Is it walkable from campus? From campus it is a 7 minute drive, or 20 minute walk. Definitely check it out! Thanks for reading and I appreciate your feedback!